Friday. Slept well in the former House of Correction and woke at around 9 o’clock to shower, dress and join Adi and Janet for breakfast of cereal, cheese, and cold meats. 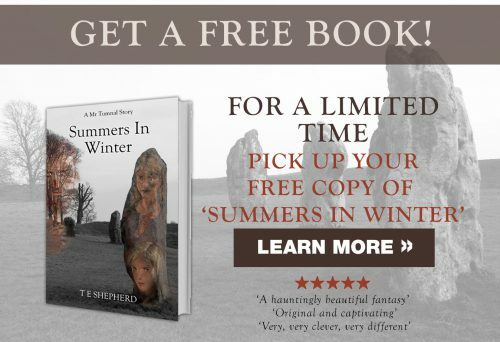 By around ten thirty we are setting out to drive back to the main road and from there, to continue our journey north. Looping around the fjórd we stock up on pâté and mjólkurtex at a general store in Patreksfjórður before driving across the hills to Bildudalur. Here, we detour down an ever deteriating track past old farms and fishing huts, and old houses done up by art-world friends of Adi (including the summer house belonging to the owner of the Reykjavik Levi’s shop), to Seládalur. 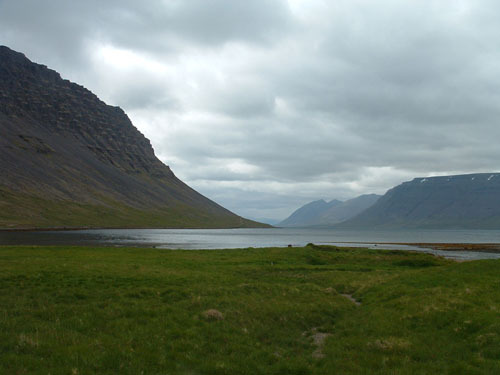 North-west of Bíldudalur, on the ánarfjórður road, is Seládalur, the home of the fanatical 17th-century pastor Páll Bjórnsson. Although he was well educated, spoke many languages and was an accomplished mathematician, throughout his life he was convinced that the district was plagued by witchs. 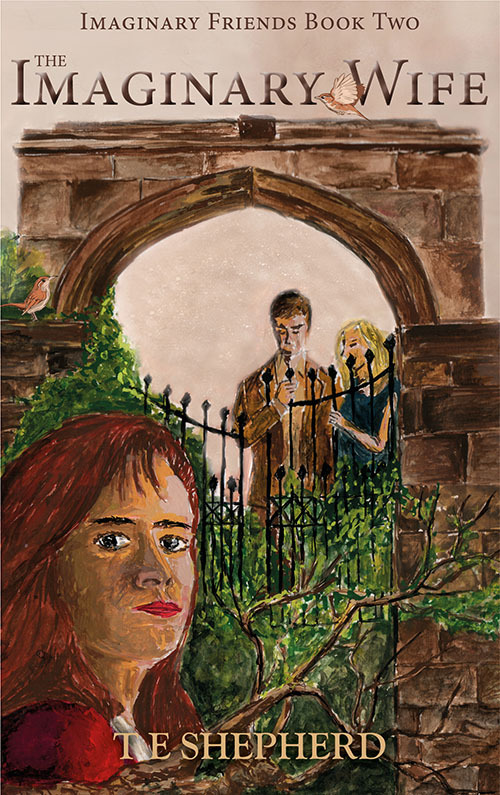 When his wife complained that she was a victim of witchcraft, the good reverend had two neighbours burnt at the stake for alleged indiscretions. 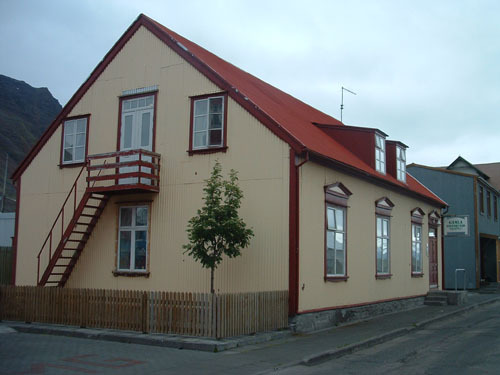 Local singer Jóns Ólafsson has opened his house as a museum. 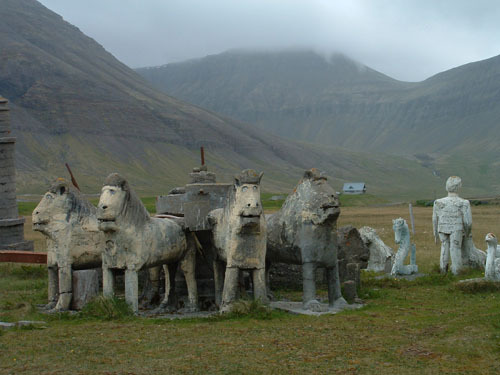 Also worth a look are the wacky farm ruins of the farmer and artist Samúel Jónsson (1884–1969). Access is by private vehicle only. 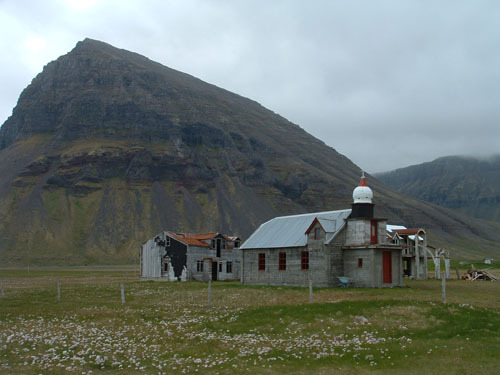 Samúel Jónsson, living at his remote farm, at the end of a northern Icelandic fjórd, constructed toy houses, churches and statues in his gardens – his intention to build a replica in concrete of St Peter’s Cathedral in Rome. Although he failed in this ambition, he did reproduce in concrete a version of the famous Patio of the Lions at the Alhambra de Granada. As we wander these ruins (currently undergoing restoration), the cloud presses in over us oppressively, hiding the tops of the steep walls of cliffs. The wind is biting, and I get a feel of the isolation of this place. I can understand how hobbies and interest, under the weight of this environment, can so easly become obsessions. We set off back to Bíldadalur, we manage to find the only petrol pump in town, but not before we visit the Popp museum of Jóns Ólafsson – a local singer, and another quiet loner, obsessional about his collection. A singer, and the only gay in town, the lower part of the house is all but a shrine to his favourite singers. 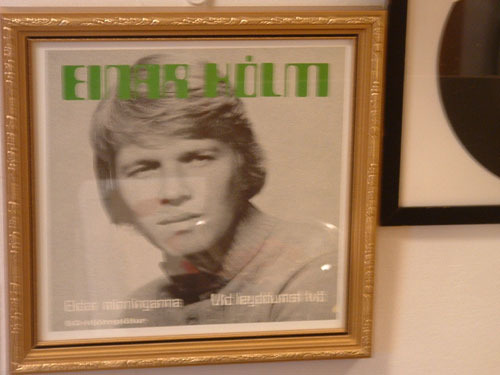 Amongst the framed records on the wall we spot my cousin Elva’s boyfriends dad on the cover of one of his singles. On leaving Bíldudalur, the paved road quickly runs out, and we head through snow covered high passes, acrosss a bleak landscape that is yet, still, hauntingly beautiful. We descend again int Dunjandisvagur – still part of the larger árnafjórður. Taking another detour we turn off the road, rounding the headland and drawing in to the lush green pasteurs at the head of the fjórd, fed by a series of waterfalls, and I find myself assessessing, froma conservation volunteers viewpoint, the access path and steps. In the conception and building they have stamp of BTCV, Naturuvend, and Chas all over them, and I guess that there will no doubt be a group of VOs (Volunteer Officers) in these parts before the summer’s and carrying out some remedial repairs. Leaving th waterfalls we find ourselves behind a car, stationary in the middle of the road. We wait. Nothing. We wait for longer. Adi honks at his car horn. The occuments of the th car in front sit up in their seats suddenly, obviously coming fast out a passionate mometn. They drive off, and we continue on our way. Passing in the next fjórd, a hydro-electric station with it’s community of houses and playground, and then to Hrafnesevi for a coffee – or in my case hot chocolate. Hrafnesis is an old turf roofed, traditional farmhouse that was the birthplace of Jóns Sigurðesson, the main responsible for the establishment of Independence of Iceland on 17 June 1944, also his birthday. Within the timbered interior of the restored farmhouse where we enjoy our warming drinks is an exhibition of amazing nature photographs by Rafn Hafnfórð. 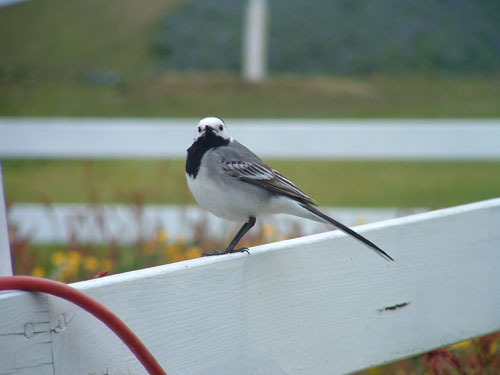 Whilst an extremely cooperative white wagtail poses for photographs on a white picket fence outside fo the small church, Janet and Adi phone home and make arrangements with Signý and Drífa – two of my cousins for Elva Brá is in Copenhagen for the weekend – for their arrival back at Brautarholt tomorrow evening for a family gathering. We set off for the last leg of today’s journey – a perilous dirt track over the mountains, up into the snow layer, adnd the cloud. There is a resuce hut on the top which I explore and photogaphically record for research purposes – to ísafjórður – making first overland to Þingeyri, a small town whre we fill up again with petrol – by means of a strange system whereby Adi uses his credit card to buy a card to insert into the pump to release the fuel. 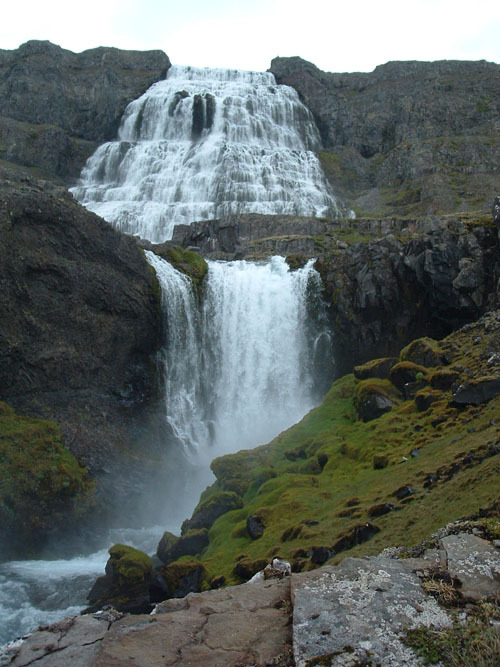 And leaving Þingeyri we find ourselves back on a paved road and our taking of Dýrafjórður cut short by a new bridge, and then a good road over the next hill and down through a lush valley of many greens, and flourishing vegetation. By wea of another bridge we cross the next fjórd straight, and head straight up the next valley towardsgrey mountains capped thickly in snow. We enter a single track tunnel hollowed from the rock with passing places for oncoming trafic only, and a junction left for the Suðeyri road halfway through. 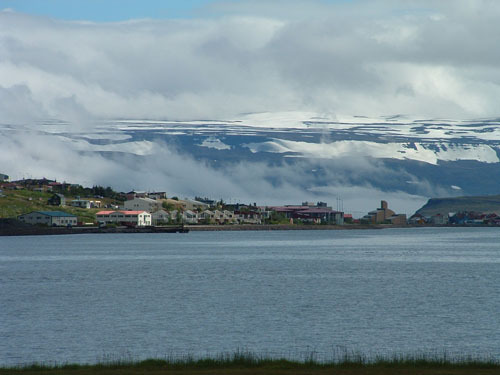 We carry on and soon descend into ísafjórður, a town – the capital of the Vestfjórds – of painted roofed houses built ona spit of land across the fjórd. 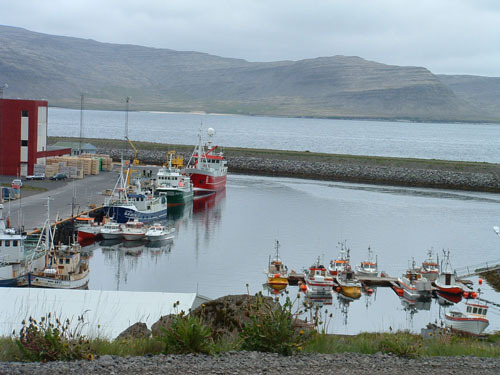 After finding our beds for the night, the Gamla Gistihúsið on Mánagata 5, we shower, change, and head out to the fish restaurant of Hotel ísafjórður where I enjoy a meal of soutp (of the day – tomato and basil), followed by fried flounder, and a warmed chocolate cake. After our meal we mooch around the town admiring the different decorative styles and colour choices of corrugated iron houses and roofs. Returning after ten thirty,still in daylight, we retire to our guesthouse rooms,and here I sit writing these pages.